Despite eking out a win against Tennessee last weekend, Jay Cutler looked like he had hit rock bottom. After a loss to the Jets and then a shutout to the Saints, Cutler put up an even worse statline against the Titans—12-for-26 for 92 yards, with a pick and, at the very least, one touchdown. Cutler was booed by his own fans in that win, and you could hear chants for backup Matt Moore. Cutler, for his part, simply did not seem like he wanted to be on a football field. It looked like more of the same in Miami’s first half against Atlanta, where the Dolphins went into the break down 17-0. Something changed, though, when the teams came out of the locker rooms, because Cutler and the Dolphins suddenly took charge, scoring 20 unanswered points to come away with a 20-17 road win, and an improbable record of 3-2. Cutler got help from Atlanta penalties, good field position, his defense, and Jay Ajayi, but he also but up his best game since his season debut against San Diego. His final line was 19-for-33 for 151 yards, one interception, and a season-high two touchdown passes. That’s not spectacular, but his short, safe passing game got the job done. Again, these are not flashy highlights in the slightest, but Cutler’s passes were enough, and they put pressure on Atlanta that they couldn’t handle. As Matt Ryan drove into Dolphins territory down 20-17 with under a minute to go, overtime (if not a Falcons win) felt inevitable. 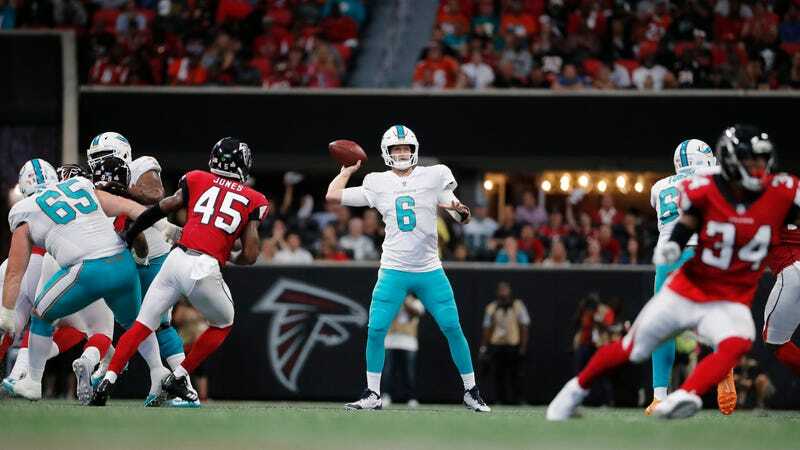 Ryan couldn’t do it, though, and an ill-advised pass across the middle was intercepted by Miami’s Reshad Jones, clinching the win following a perfect second half in which the Dolphins scored on all four of their drives. Jay Cutler is now over .500. What a weird season this has been. Bad Quarterback Performance Of The Week: What Is Jay Cutler Even Doing Here?